The combination of damp weather and a new mulching of wood chips created a massive crop of mushrooms around and underneath our hostas. We knew there were a lot of mushrooms because they were beginning to crowd out the hostas, but when we started to pull them up we discovered there were even more than we had thought. We filled a large tote almost immediately… and then filled a second one. In just a few minutes more we had filled the wheelbarrow. I have no idea if the mushrooms were edible or not. Some of the whiter ones looked and smelled exactly like the mushrooms I buy in the stores. I think they MIGHT have been safe to eat. Mixed in with those were some odd textured creamy-colored mushrooms, brownish ones, and a few bright yellow mushrooms that LOOKED poisonous. We were careful about even handling those. This photograph shows just that first day’s haul. 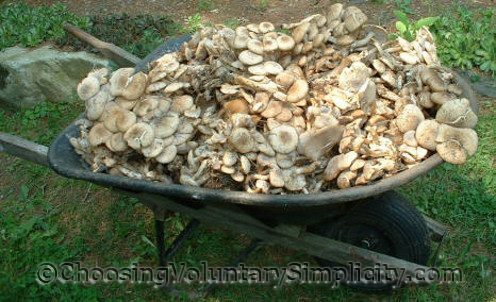 We pulled mushrooms for several more days after that and filled the wheelbarrow full a second and third time and almost full a fourth time before the mushrooms finally stopped producing. Regardless, it was an impressive crop. If only we could grow the edible mushrooms that easily! Wow that is impressive. I always look forward to seeing the ring of mushrooms that pop up near a tree that used t stand in my front yard, I’ve never seen anything like your haul though! Curious, did you compost them or something else? Lisa, we took the mushrooms into the woods and scattered them around. It would have been easier to compost them, but we didn’t want to take the chance of more mushrooms appearing everywhere we used the compost! I’ve never seen so many mushrooms all together like that. That’s really AWESOME! I bought a Mushroom Kit once but didn’t have a lot of luck with growing them. I think we were supposed to end up with 15 lbs of mushrooms or something like that but we had only a few actually get big enough to eat. Your growing conditions under the hostas must have been ideal for mushrooms. Too bad you can’t duplicate that for a cultivated crop. Have you ever thought of buying mushroom spore and growing mushrooms under similar conditions? I bought some. The spore came in a small clear envelope and I just sprinkled it in sawdust. In just a few weeks I had mushrooms growing and they have continued to grow each year. I wonder sometimes if some wild mushrooms have gotten into the sawdust but we have eaten them and never had any reactions so I guess they are ok. Some of those whiter ones look very edible to me but I don’t think I would have taken the chance either. My neighbor used to feel confident she could tell which mushrooms were edible until she got some bad ones and almost died. I tend to lean towards being overly cautious but I bet it drove you nuts to have all those mushrooms and have to throw them away. I read your blog first thing every morning with my coffee. It’s a great way to start my day. Those appear to be Agaricus silvicola mushrooms – though I cannot say for sure without a spore print or other information. If they are, they are “technically” edible though I would not eat them without verification (and then only in small amounts to establish ‘tasteability’ as well as ‘ediblility’). The look and smell of supermarket varieties is apt because they are related. 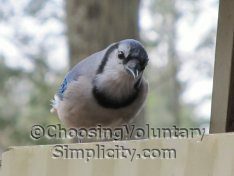 However, there is NO way to tell an edible mushroom from a non-edible or extremely poisonous variety except by the time consuming and old fashioned method of simply keying it out with a good mushroom guide. (Or better, someone who knows. REALLY knows!) Many edible mushrooms have look-a-likes. In this case, if it is A. silvicola (otherwise known as the deer mushroom or forest mushroom) it looks a lot like Destroying Angel – which is whiter, but has the same “veil” on the upper stem – and will kill you very painfully in about 3 days by totally dissolving your liver. Enough said.